PUNE: With the growing concerns regarding the pollution and rising prices of oils, Indian government has ramped up its efforts to promote the adoption of electric vehicles in the country. Various initiatives have been launched by the government, in order to help the country transition from oil-powered vehicles to electric vehicles, pursuing its goals of cleaner future. In 2013, the government of India launched the National Electric Mobility Mission Plan (NEMMP) 2020. The initiative is aimed at promoting national fuel security by promoting hybrid and electric vehicles in the country. The government is looking to achieve 6-7 million hybrid and electric vehicle sales year on year, starting 2020. Under the NEMMP 2020, the government of India launched the scheme Faster Adoption and Manufacturing of (Hybrid &) Electric Vehicles (FAME India), with an initial allotment of Rs. 75 crore in the Union Budget 2015-16. Leveraging the opportunities presented by the market and support of the government, a number of Indian startups have started to focus on electric mobility solutions. Pune-based electric vehicle startup Tork Motorcycles was founded by Kapil Shelke in 2010. 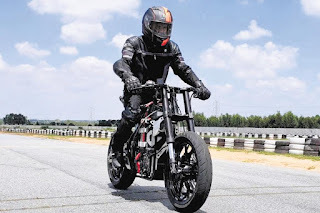 The startup designs and manufactures electric performance motorcycle. Its flagship product is Tork T6X, a smart and technology-driven electric motorcycle. In May 2018, Tork raised around Rs. 45 lakh from Ola co-founders Bhavish Aggarwaland Ankit Bhati. Earlier in February 2018, the startup had raised Rs. 30 crore in a funding round from Bharat Forge. Bengaluru-based electric mobility startup Ultraviolette Automotive was founded by Narayan Subramaniam and Niraj Rajmohan in 2015. It aims to create sustainable urban transportation driven by clean energy. It is focused on building electric vehicles to enable a clean transportation ecosystem. The startup plans to launch its first two-wheeler by the end of 2019. TVS Motor Company-backed Ultraviolette Automotive has a team of 45 members from aviation, automotive, and consumer electronics background and are focused on developing electric motorcycles embedded with smart features like onboard diagnostics, preventive maintenance, over the air upgrades, and ride customization. Coimbatore-based Ampere Vehicles was founded by Hemalatha Annamalai in 2008. The company manufactures and also designs, develops and markets electric vehicles including cycles, scooters, and three wheelers. Earlier in August 2018, it was reported that Greaves Cotton is set to acquire a 67% stake in the electric vehicle startup for Rs. 77 crore. Previously in April 2016, Ampere Vehicles last raised an undisclosed amount of funds from Kris Gopalakrishnan, co-founder of Infosys and Chairman of Axilor Ventures. Bengaluru-based electric vehicle startup Emflux Motors was founded by IIT Delhi graduate Varun Mittal, along with Ankit Khatry and Vinay Raj Somashekar in 2016. The startup is looking to create an ecosystem of 10 million electric two-wheelers in India by 2027. Emflux is looking to capture the electric vehicle market with its smart and premium electric motorcycle Emflux One. Emflux has raised more than $500,000 in funding across all rounds, according to Crunchbase. It also counts Samar Singla, Co-Founder of Jugnoo, among its investors. Mumbai-based smart mobility startup Strom Motors was founded by Pratik Gupta, Jean-Luc Abaziou, and Dr Gimer Blankenship in 2011. The startup aims to create clean and smart mobility solutions through sustainable automobile technology. In line with the goal of a cleaner future, Strom Motors unveiled its flagship product Strom-R3, an intelligent electric car. Strom-R3 is a fully electric car, which has all the luxuries of a premium car, including air conditioning, to suit the needs of its users. In September 2018, Strom Motors raised an undisclosed amount of seed funding from Indian Angel Network. Gurugram-based smart electric scooter startup Twenty Two Motors was founded by Parveen Kharb, along with IIT Delhi graduate Vijay Chandrawat in 2016. The startup works with latest technologies like artificial intelligence, lithium-ion storage, internet of things, and advanced electric power trains to power the smarter and cleaner vehicles of tomorrow. Its flagship scooter Flow is designed for the Indian market, providing all the premium features. Last month, it was reported that Twenty Two Motors will be getting Rs. 480 crore from Taiwan-based vehicle manufacturer Kymco, for a 25% stake in the electric vehicle startup. Gurugram-based electric two-wheeler startup Okinawa Autotech was founded by Jeetender Sharma and Rupali Sharma in 2015. The startup aims to build a cleaner and greener future by building affordable and eco-friendly e-scooters for the Indian market. Okinawa provides a range of electric scooters, namely Ridge+, Ridge, and Praise, based on the needs of its customers. Powered by green technology, Okinawa has its manufacturing facility in Bhiwadi, Rajasthan, with more than 200 dealers in its network. The startup has also partnered with Pizza Hut, Vogo, Fae Bikes, and KDM Group. Mumbai-based energy storage startup ION Energy was founded by former Haptikemployee Akhil Aryan in 2017. The startup has developed its flagship battery, coupled with its proprietary battery management system and other energy efficient technologies, to accelerate the adoption of electric vehicles and boosting the ecosystem. In May 2017, ION Energy raised an undisclosed amount of funds from Haptik Co-Founders Aakrit Vaish and Swapan Rajdev, and Sushill Jiwarajka, Founder of Nippon Batteries, according to Crunchbase. Bengaluru-based electric mobility startup Cell Propulsion was founded by Nakul Kukar and Paras Kaushal in 2016. The startup provides futuristic technology for building autonomous electric vehicles. Its application agnostic innovation platform Simba, enables quick and easy system integration and reduces robotics project development time. It also offers other hardware solutions like energy storage, charging stations, and electric drives. In January 2018, Cell Propulsion raised Rs. 70 lakh in funding. Bengaluru-based electric vehicle startup Ather Energy was founded by two IIT Madras alumni Tarun Mehta and Swapnil Jain in 2013. The startup focuses on designing and selling premium electric scooter for the Indian market. The startup launched its first smart electric scooter in February 2016. These scooters come with smart features like an interactive dashboard with in-built navigation, Ather app, to manage vehicle diagnostics, view ride patterns, and tips to improve ride performance, remotely. In July 2018, Ather Energy last raised $19 million in funding from Hero MotoCorp, taking its total funding to $59 million, according to CrunchBase. The startup also counts Tiger Global Management and Flipkart founder’s Sachin Bansal and Binny Bansal, among its investors.